Depressive realism refers to the findings that depressed individuals tend to be more accurate or realistic than nondepressed persons in their judgments about themselves. Specifically, research suggests that nondepressed people are vulnerable to cognitive illusions, including unrealistic optimism, overestimation of themselves, and an exaggerated sense of their capacity to control events. This same research indicates that depressed people’s judgments about themselves are often less biased. Depressive realism is provocative for two reasons. First, it contradicts both the intuitions of common sense and the mental health profession’s assumption that mental health should be associated with a high capacity to perceive and test reality. Second, depressive realism also presents a serious challenge to cognitive theories of depression, which have become increasingly important over the past 30 years. According to cognitive theories, depressed individuals make judgments about themselves that are unrealistic, extreme, and illogical, and cognitive therapy for depression is designed to correct these irrational perceptions. If depressed people already view themselves realistically, their thought patterns may not need the correction that cognitive therapists propose to provide. In fact, there is good evidence that cognitive therapy works to alleviate depression, but it may work by training patients to construct optimistic illusions about themselves rather than by teaching them to think more realistically. The study of depressive realism also may serve as a bridge between clinical and experimental psychology. Unlike neuropsychologists and visual perception researchers, clinical psychologists rarely have studied abnormal functioning to develop theories about normal psychology. However, an understanding of depressive realism may allow psychologists and researchers to see the adaptive functions of optimistic biases in normal human thinking. What is the evidence for depressive realism? In one of the first studies, depressed and nondepressed under-graduates were asked to judge their degree of control over an outcome of a button-pressing task. The experimenters systematically varied the actual degree of control as well as the frequency and valence (good or bad) of the outcome. Nondepressed students judged incorrectly that they had control over good outcomes but not bad ones. Depressed students might have been expected to show the opposite bias; instead, they were consistently accurate judges of their control over events. Many other studies of depressed children, college students, and older adults have confirmed these results. Experiments also show that depressed people are better than average at predicting events in their own lives, especially misfortunes. The participants in most of these studies were only moderately depressed, but it is not clear that even severely depressed people are unrealistically pessimistic. The evidence is mixed; some studies have found that even patients hospitalized for depression are quite realistic about themselves. Depressive realism and nondepressive optimistic illusions are also seen in social situations. One study found that normal individuals and psychiatric outpatients who were not depressed rated their own social competence much higher than objective observers did. Depressed patients, in contrast, agreed with the observers. There is also evidence that depressed individuals are better at evaluating the impression they make on others and that depressed mothers report their children’s behavior more accurately than do non-depressed mothers. 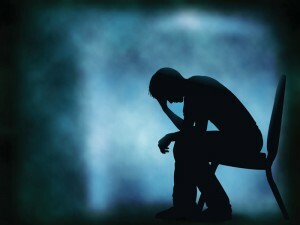 However, depressed people are not more realistic in judgments about others. Studies consistently find that although nondepressed people succumb to optimistic illusions about themselves, they are fairly unbiased in judging others. Depressed individuals do the opposite. For example, depressed students judge their own control over outcomes accurately but judge incorrectly that others have control over good outcomes that were actually uncontrollable. In another study, depressed and nondepressed undergraduates and psychiatric patients were asked to predict whether the roll of two dice would have a successful outcome, defined as a 2, 3, 4, 9, 10, 11, or 12 (a 44% chance). When subjects rolled the dice themselves, depressed students and patients made more accurate predictions. When experimenters rolled the dice, nondepressed students and patients guessed more accurately. Does depression cause people to be more realistic about themselves, or does realism about the self make one more vulnerable to depression? Research suggests that it works both ways. When experimenters used mood inductions to make nondepressed students feel temporarily depressed and depressed students feel temporarily elated, their susceptibility to illusions of control was reversed. But, individuals with optimistic illusions of control are also less vulnerable to depression under stress. After performing a task measuring their judgments of control, undergraduates were asked to solve problems with no answers. Their mood was assessed immediately before and after the inevitable failure on the unsolvable problems. At this time and a month later, they also completed a checklist of depressive symptoms. At the second time, they also listed stressful life events they experienced in the previous month. The students who were realistic about their control over outcomes on the original task showed more symptoms of depression after they failed to solve the unsolvable problems and more depression a month later if they experienced many stressful events during the month. Students with strong illusions of control on the original task did not become more depressed when they failed to solve the problems or a month later even if they had experienced many negative life events. Thus, depression and realism appear to be interdependent. The nondepressive tendency to engage in overly optimistic thinking about oneself may have adaptive behavioral and emotional consequences. Optimistic illusions may function to enhance self-esteem, increase resilience under stress, increase capacity for persistence, and decrease vulnerability to depression. It is ironic from the standpoint of the cognitive theories of depression, but maladaptive features of depression such as low self-esteem, sadness, and decreased persistence might result from the loss of normal, healthy personal illusions. Alloy, L. B., & Abramson, L. Y. (1988). Depressive realism: Four theoretical perspectives. In L. B. Alloy (Ed. ), Cognitive processes in depression (pp. 223-265). New York: Guilford Press. Alloy, L. B., & Clements, C. M. (1992). Illusion of control: Invulnerability to negative affect and depressive symptoms after laboratory and natural stressors. Journal of Abnormal Psychology, 101, 234-245.